Get acquainted with the minor and major blues scales: how to identify the ‘blue notes’, how they are linked to the pentatonic scales, and simple box patterns. Despite its name, the blues scale isn’t exclusive to the likes of Stevie Ray Vaughan and BB King. It has been deployed in all manner of genres, from pop to rock to even heavy metal –Metallica’s Enter Sandman, Led Zeppelin’s Black Dog and Stevie Wonder’s Sir Duke are just three of many songs that use it. So its versatility makes the blues scale one of the more important scales you’ll learn. Before we dive into the lesson, you’ll need to be familiar with pentatonic scales. You’ll see why soon. Both the major and minor blues scales are, essentially, pentatonic scales with an added ‘blue note’. That note is also referred to as the “worried note”, and earned its nickname from its jarring, almost dissonant nature within its ‘parent’ major or minor scale. Used tastefully, though, and it can create delicious licks. Like with the other scales we’ve covered so far, there are formulae – based on note intervals – that you can use to derive major and minor blues scales in any key. So if you’re familiar with our previous lesson, this will be a walk in the park. So just what are the ‘blue notes’ to add to the pentatonic scale? 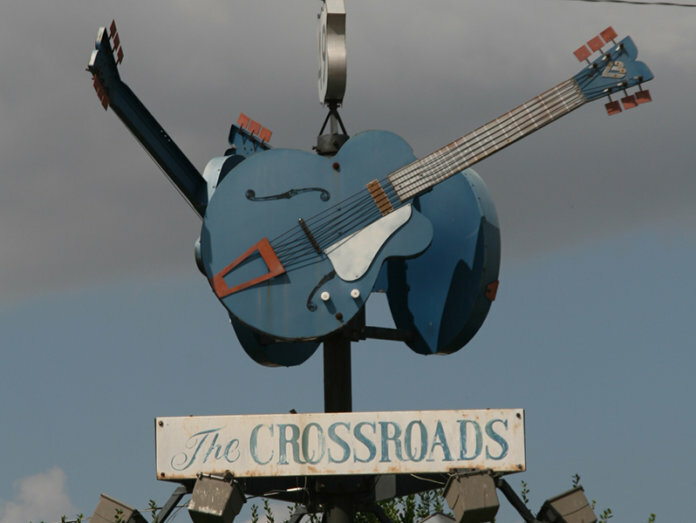 In the major blues scale, it’s a ♭3, while in the minor blues scale, it’s a ♭5. Of course, the minor pentatonic already has a ♭3. 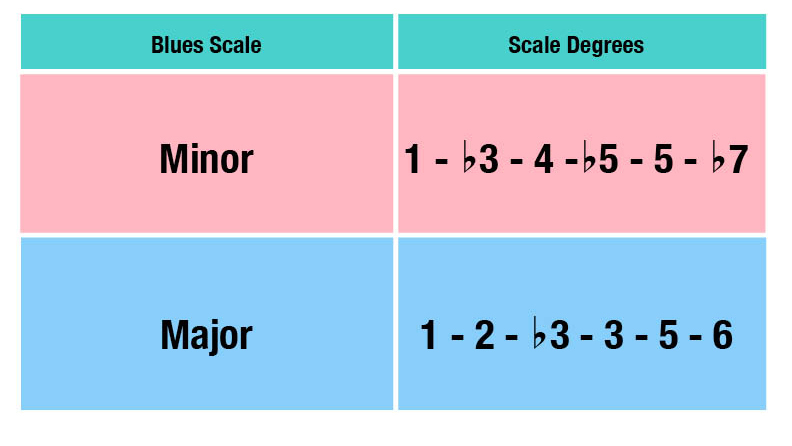 Here are the formulae for minor and major blues scales. In similar fashion to the pentatonic scale, the formulae are applied to the major scale. As you can see, we’ve simply added a blue note – a flattened fifth – to the minor pentatonic scale. In the A minor key, that’s an E♭. On the other hand, the blues note for the major blues scale is a flattened third. So this is what it looks like in the A major key. You’ll only have to add a C note to the A major pentatonic. However, it’s not enough to memorise the blue notes for all the keys. Understanding how to derive these notes will grant you deeper insight into blues scales and how they’re entwined with their pentatonic cousins. Box patterns are useful as they paint a clearer picture of where the blue notes lie within their respective scales. To keep things familiar, we’re going to use the CAGED system once again. But this time, in addition to paying attention to the root note (indicated in white), take notice of the blue note (indicated in blue) as well. Everything remains the same as in the minor pentatonic scale, save for the addition of the ♭5 note. Pretty straightforward, isn’t it? Now, on to the fun stuff. Single-octave boxes are the building blocks of diagonal patterns that stretch across the entire length and width of the fretboard. So with these patterns in your bag of tricks, you’ll be a more confident and versatile guitarist. But first, the basics. And now, for the diagonal pattern. This may look intimidating, but they’re essentially several octave boxes strung together diagonally. And there you have it, the blues scale. Once you’ve got the pentatonic box patterns down, it won’t take you long to get the hang of their blues equivalents. A word of caution, though: Treat the blues note like a spice. Used sparingly, it elevates your ‘dish’. But too much of it can be overpowering and, ultimately, unpleasant.